What are Simply Supported Slabs? Simply supported slabs are supported on columns or stanchions. They have support on all four sides. 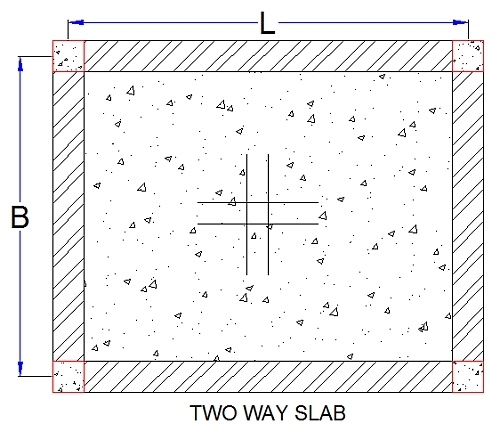 Simply supported slabs are classified as One way slabs and Two way slabs. 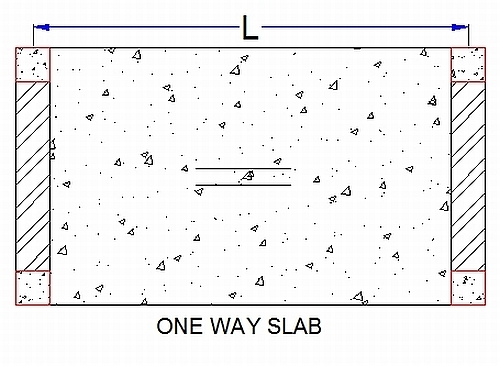 One way slabs bend in one direction only and transfer their loads to the two support beams in opposite directions. Their main steel in on shorter span length. L/B ratio is generally less than 2. Two way slabs bend in both directions, and transfer their loads and stresses on all four sides. L/B ratio is equal to or greater than 2. Simply supported slabs don’t give adequate provision to resist torsion at corner to prevent corner from lifting. The maximum bending moment will be given if the slabs are restrained. But atleast 50% of the tension reinforcement provided at the mid span should extend to the support. The remaining 50% should extend to within 0.1Lx or Ly at the support as appropriate. You can use a free app to design simply supported RCC Slab panel. This reinforcement runs perpendicular to the main reinforcement in order to distribute the load and to resist the temperature and shrinkage stresses. The diameter of the bars varies from 8mm to 14mm and should not exceed 1/8th of the overall depth of the slab. For distribution steel, the diameter varies from 6mm to 8mm. The bottom cover for reinforcement shall not be less than 15mm or less than the diameter of such bar. l/b ratio is GREATER THAN 2. How many bags of cement used in 1 sq. Ft. Of concrete slab? Thanks for such a imp. Service . box culvert design 4.69* 4.81m- there is a pier between two abutment wall. & the height of the walls are 7.75ft . I want the slab design for the culvert. I wanted to extend my house vertically which has cement roof.my problem is I want to cast rcc slab at 10 feet on my already existing walls which are 15 feets in height.I dont want to break those walls as I want to extend my house vertically. my mason idea is to cast rcc slab upto 05 inches inside existing walls. is he right technically??? or how it should be done? Pl this is very important for me and my family. Informative for students and learners. Thanks and goodluck. Thanks for the web side having verious useful guidelines are thre. I am making house having 970 sq.feet aera(48*20 feet) main rooms covering 400 sq feet were built earlier without columns . while making bounderies I have given columns having 3-4 feet depth and within 12 feets with 10 mm tmt bars. all the columns are joined by foot beams. Now for making 1st floor i have utilised the idle area and making 4*4 columns using 12 mm tmt bars and extending the existing 10 mm columns by using 12 mm bars. Columns are having 4 rods. Can I go for 2nd floor with this structure. Pl. suggest and guide for construction. i m going to use 1:1.5:3 proportion for entire concrete work for this G+1 structure. 5) reinforcement for RCC footing tor steel 10mm, 9nos. of bar bothway. 8) All the columns connecting by plinth beam of size 230mm x 450 mm. 13) Roof slab reinforcement details same as 1st floor slab. * I wanted to know whether i can go ahead with this RCC details OR some changes needs to do. if yes then plz suggest. * Also i wanted to know for ground floor toilet block is it required to take internal plinth beam to construct 230mm thk. wall for toilet block or can i construct toilet block wall by doing proper soling & PCC of 150 mm thk. Hi,actually i am preparing report on analysis & design of multistory building with software package. For validation purpose doing manual calculations. I am struck up with load distribution. Please help me out. 1. moment in simply supported one-way slab is max at the middle and zero at the supports. my question is why half of the bottom bars are bent up at the supports? 2. my other question if the slab sits on masonry block wall and a second masonry wall sits on top of the slab coninside with the wall below, will it considered as restrained and required negative bars? I gave my plot to a builder.aftermaking ground floor a full parkng area. After finding that the colums supportd by tie beams are not placed at the required positions unknowingly, He is suggesting and intends to cast upper floor/first floor by flat beams included in the lentile.Is he doing a right thing? Is it safe as compared to the regular practice(i.e a lentile on columns and tie beams) request advise? Have a look at our new design services offered by Civil Projects Online. I am very much thankful to you for these guidelines. I am very much thankful for these guidelines. hi.i m m.tech student of structure engineering if anybody knows about fiber reinforced concrete then please reply me. Thanks for the detailed information — much appreciated! I can guess a surveyor can be used in finding and utilizing optimum locations for dumping refuse in a such a way that the space can be reused for dumping in a few months after all the refuse has decomposed, and also ensure water table and surrounding environment remains safe from pollution. But I don’t know very much about the subject. RCC Design required for project in PHED. I would be really glad if I could be of some help to you. Send me your details regarding your PHD Project… We shall discuss the project in detail and do the best we can. I have a structural details of the house i am going to construct. I found the structure is heavy. Is it possible to suggest whether the structural details are fine for the proposed building?. I needed the knowledge of rcc design. i shall be thankful to provide guide lines. ITS VERY USEFUL FOR ME AND IT MAKE EASY TO DESIGN SLABS, SINCE THE STEPS ARE PRECISE AND AS PER CODE. THANKS……..